Castle Acoustics was a Yorkshire-based company started in the early 1970s. 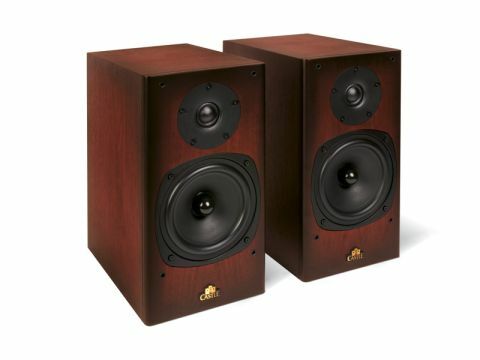 Best known for its rich, real wood veneers and refined acoustic, the firm soon established a following from those appreciating a warm, full-bodied sound. As with many of the British greats, however, Castle fell upon hard times at the turn of the millennium and came under the ownership of IAG (International Audio Group). With IAG's impressive portfolio that includes Quad, Castle should be in safe hands and as if to prove the parent company's commitment, the all-new Knight range is voiced by IAG's Director of Acoustic Design, Peter Comeau – of Heybrook HB1 and Mission 780 fame. It has to be said that neither of these speakers has the 'Castle sound', so the question is; have his talents been successful with tuning the Knight? There's nothing especially innovative with the design, but such a conservative approach should suit the targeted audience. Crucially, the Knight range uses high-quality wood veneer and is available in eight varieties. The veneers are genuine, book-matched and mirrored slithers of tree and not reconstituted pulp. The cabinet itself is made from 15-millimetre MDF, with bracing across both planes. A flush-mounted rear bass port is fitted with a mesh to dampen the exiting air. The drive units consist of a soft-dome tweeter and fibre woofer. Again, very conventional, but the decision not to select a metal dome tweeter is a wise move, as their occasional edgy characteristics would not have suited the Knight 2. The woofer chassis is an ordinary pressed steel affair, but is magnetically shielded to allow for safe placement near magnetic recordings and CRT screens. A bi-wirable crossover, with gold-plated terminals, completes the good first impressions. And with an above average sensitivity of 90dB, we expect the Knight 2 to present an easy amplifier load. Given the price, the standard of finish is exceptional. Whereas rivals such as the Mordaunt-Short Mezzo 2 (£450) and Bowers and Wilkins 685 (£380) use vinyl wraps, the Knight 2 stands out with its real-wood veneering. The full process, including sealing and waxing, apparently takes five days and in an ideal world the veneering would be extended to the inside of the cabinet, too, as this has a beneficial effect on the sound quality. There are no complaints with the solidity of the cabinet, in which multiple bracing adds considerable weight and rigidity to these standmounts. Items such as the basic internal speaker cable show where costs have been cut, but this is an impressively engineered speaker. Castle fans will be relieved to hear that the Knight 2 has kept all the Castle Acoustics qualities intact. The bass response errs on the side of taut control, rather than ultimate weight and is all the better for it. Sound staging is particularly spacious with vocals being especially well portrayed. Explicit but not aggressive, the Knight 2 strikes a very fine balance. Against the Mezzo 2, you will find the Knight lacking a defining edge with, for example, drum beats, but the smoother balance will be ample compensation for most. Acoustic music suits these speakers with vocal texture readily revealed. With classical music the Knight is one of the best speakers in its class. A true sense of space and depth creates a tension not usually found in this type of speaker and if you enjoy unforced realism, then you'll appreciate the Knight 2's subtle qualities of presentation. IAG deserves praise for not only producing a new speaker that looks like a Castle, but for producing one that emphatically sounds like a Castle, too. In fact, we'd go further by saying that this is probably the best-sounding budget Castle speaker ever made. In addition to the traditional qualities of accuracy and refinement, the Knight 2 adds unforced detail and first-class soundstaging. Whilst it won't be the first choice for lovers of high-octane dance music, everyone else will be more than satisfied by its subtle charms. The class-leading finish cements this as a classic Hi-Fi Choice recommendation.